According to director Rakeysh Omprakash Mehra, his upcoming epic Mirzya is three films in one. It is the modern retelling of the Punjabi folk tale Mirza-Sahiban, as well as a classic and unique presentation of the traditional story and one more element that brings it all together that we will find out when the film hits theaters on October 7th. The film introduces Harshvardhan Kapoor and Saiyami Kher, along with Anuj Chaudhary, all of who make their debut into the world of cinema in this untold love story of estranged soul mates. Also part of the epic story of love are the brilliant Om Puri, Art Malik, K. K. Raina as well as Anjali Patil. The story is brought to life in the words of esteemed poet and lyricist Gulzar. For the musical story of the film, Mehra once again worked with the incredible trio of Shankar Mahadevan, Ehsaan Noorani and Loy Mendonsa. Since the tale is both modern and classic they worked with an eclectic and amazing list of singers including Daler Mehndi, Pakistani Sufi singer Sain Zahoor, a folk singer from Baluchistan who sings in Balochi Akhtar Chinnal, a Rajasthani singer and musician Mame Khan, as well as the Nooran Sisters, Siddharth Mahadevan, Shuchismita Das, K. Mohan, Kaushiki Chakrabortty, Shankar Mahadevan and The Salvation Singers chorus. I had no idea what to expect from this album but eagerly sat down to listen and experience the magic of the music and the poetry of the lyrics. Read on to see what I and my colleague Aashi Gahlot thought of the music and lyrics of Mirzya. “These milky valleys of mist have centuries flowing through them. Full of passion and such incredible music, ‘Mirzya’ is an outstanding track. 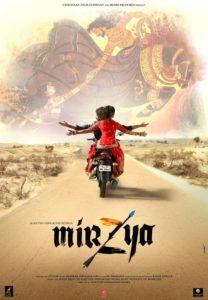 You are taken into the classic world of Mirzya just within the first few notes. The singers Daler Mehndi, Sain Zahoor, Akhtar Chinnal are beyond incredible. I loved all the tones, the energy, the feeling, the range and power of the vocals; it truly made the song extraordinary. The middle percussive section by Taufiq Qureshi is surprising and a cool break. I also loved the Flute/Pungi by Naveen. Then the ever-fabulous Nooran sisters come in and add another fantastic layer. All the music, sounds and vocals meld together to make you feel the flavor, the tone, and the beat of the worlds of Mirzya. Gulzar’s breathtaking lyrics introduce the film as an eternal love story. The emphasis on love flowing through “milky valleys of mist” adds connotations of a mystery. My only negative is the chorus in parts it seemed extraneous and distracting. However, it does work in the end mixed in with the underlying beat. It is the vocals, especially that last a capella Mirzya that gives you chills! Brilliant! I loved the beautiful instrumental beginning of ‘Teen Gawah Hain Ishq Ke’, then the amazing vocals by Sain Zahoor come in and makes that music even better. The song transposes to something completely different with Siddharth Mahadevan taking the lead and he is fabulous. The track has more of a modern beat with still that underlying folk flavor which makes for a terrific sound. The lyrics beautifully portray love: love does not need approval because it is already approved! Again I felt the chorus was overdone and not needed but that may be a personal preference. I loved the music especially the guitar sections. Siddharth sang with such wonderful feeling that it really made the song! I wish it had been pared down a bit to the more simple song, I loved that, but I imagine within the world of the movie this will play better. Give it a listen! With a very cool syncopated beginning ‘Chakora’ features Mame Khan, Shuchismita Das, and Akhtar Chinnal. The singers are once again incredible. The almost flex and flow of their vocal lines with the backup music creates a unique sound not heard before. The fast paced feel of the song reflects the intensity of the flying partridge and ultimately, of love. It does have many different modes, moods and sounds, which is bit strange but you cannot deny the mastery of the composition and of the singers. The traditional folk lyrics with the fusion beat create the mood of being in two worlds merging into one. Again this one will be very interesting to see within the story and worlds of Mirzya. The love song ‘Aave Re Hitchki’ is inspired by a Rajasthani folk song representing love in separation. Folklore has it that when a person hiccups, there is someone thinking about them. In this song, the beloved has hiccups because the lover is thinking of them. The beloved expresses the pain of separation and how everything has become empty and complains; stop making me miss you when night falls. Besides the incredible, I know I keep using that word but it is the only one that fits, because well it is Gulzar, lyrics, the music and singing on this track is my favorite on the album. Shankar Mahadevan sings with such longing and feeling and the addition of Mame Khan takes it up even higher on the excellence scale vocally. Also this music must be mentioned, especially the performance of the Mame Khan troupe on the Dholak and Sarangi and Neill Mukherjee on guitars that adds even more musical magic to the song. There are a lot of tempo changes, instruments weaving in and out but it all works so well together that you get lost in the story of the song. I could listen to this over and over again and in fact have! Seeing the video added even more and I can’t wait to see this while getting lost into the story of Mirzya! Starting with a very syncopated vocal line that is just to cool we are once again treated to the vocal talents of the Nooran Sisters, Sain Zahoor, Akhtar Chinnal, and Daler Mehndi. And once again they are absolutely brilliant. Each vocal line is in its own world and it is a world we happily listen too. Lyrically this song is oozing with heartache – fierce heartache! It has the mood of someone happily destroying themselves in love and the song is a celebration of this. It again is a mix of more modern beats and sounds with very classic sounding vocals and somehow it works perfectly. It is unexpected but very cool. It also does swing to the more classic instrumentation but those are just moments. This song again is something that is new, fresh and I cannot wait to see what is happening on screen when this is playing. “There was one stream. It was impossible for the stream to leave the shore on either side. The composition of this song is a masterpiece! The vocals are so haunting. The beginning leaves you stunned. The Nooran Sisters sing with such intense passion and sharp inflection. While K. Mohan brings in the smooth tone and so much emotion it makes the song even better. Add in the chorus, which I really, really liked in this track and you have another highlight of the album. The lyrics speak of a stream, which may represent destiny or love – where there is no choice but to flow with what’s been given. Musically the acoustic guitar as well as the cool percussive layers gives a contemporary feel to the track. The mix of old and the new makes magic! We could go on and on but say just go listen to it! Starting off with the brilliance of Mame Khan singing this traditional folk song you are already in music bliss. But then SEL go somewhere totally unexpected and add a jazz instrumentation and it is just beyond good. This is a Seriously Cool Jam. It is unusual and almost surreal, a crossing of cultures but it so works. The song’s lyrics are sad and describe a daughter leaving her father’s home. Her palanquin is leaving to go to her beloved. The music including the Upright Bass – Abhinav Khokhar, Melodica –Shankar Mahadevan, Trumpet –Victor Garcia, Drumset / Cymbals – Kalyan Pathak, and the piano line sing as incredibly as Mame Khan and Shankar Mahadevan. Bravo Shankar, Ehsaan and Loy Bravo! Man I love this song! “Oh crow; please bring me news of my beloved. A lovely orchestral instrumentation begins this track and you have no idea where it may go but you are eager to hear. Then you hear Kaushiki Chakrabortty who is absolutely superb. As you continue further into the track you feel as if you are listening to a concert of epic music and immense vocal talent. The orchestration is masterful and shows the incredible range and talent that is Shankar Ehsaan and Loy. Brilliant. Haunting! This musical theme speaks sorrow. The feel of separation is immense. Full of haunting love, sadness and longing, all that is conveyed just in the beautiful notes of the instruments. The flute does breathe some hope into a desperately sad love story. It honestly made me tear up just listening to it. Another SEL triumph! I am so moved by the immense beauty and sorrow of this composition. Also included on this epic set of music are six tracks by Daler Mehndi; ‘Yeh Wadiyan Doodiyan Kohre Ki’, ‘Mirza Se Darre Khuda’, ‘Mera Mirza Sher Jawan’, ‘Lahoo Luhaan Zameen Hui’, ‘Puchh Na Pende Mamle’, and ‘ Phaa Paye Na Ishq Da’. Each outstanding, with Daler Mehndi singing his heart out in absolute perfection As we understand it these are integral to the tale of Mirzya but we have to wait until we see the movie come to life on screen! This album is a feast for the ears. It has so many unexpected moments, magnificent singers, the stunning poetry of the lyrics and incredible (yes, again) music that it is one of the best and most interesting soundtracks I have heard in a long time. I truly am in awe! This is not to be missed and if the music and, of course the trailer, is anything to go by then neither is Mirzya! Stay tuned we have an incredible interview with Mr. Mehra coming up soon, another thing not to be missed! 16 queries in 0.692 seconds.